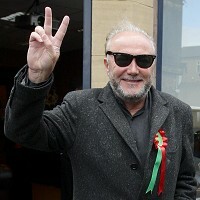 The liberal metro-socialists of Westminster and North London were mortified this morning when they woke up to the front page news that barking nutter George Galloway had last night been elected by the good people of West Bradford to be their very own MP with a 10,000 majority. They're probably asking, just as egg throwing protestor Thomas Johnson did this afternoon, "Why would any city want a politician that got kicked out of two constituencies?" Quite! There will of course be much public hand wringing amongst all those who so enthusiastically decided that a multi cultural society would be a great thing for the rest of us. Most of us meanwhile will enjoy their public angst and attempts at mitigating the polling disaster in the high turnout result. The reason it happened is, of course, pretty straight forward but encroaches on so many super-sensitive issues that no politician will speak up, although I can assure you, they are most certainly aware of them. Some 67 languages are spoken in Bradford and another grubby little fact that you won't be hearing from politicians is that much of the population in West Bradford originates from the rural, poor parts of Pakistan and not the urban centres. That is, it's more like Waziristan than Karachi. Many of the people then live and vote as would a clan. This is evidenced for example, by the high incidence of first cousins marrying first cousins in the area which has led to a higher than the national average incidence of recessive genetic disorders and higher infant mortality. The warning from West Bradford is just what a segregated society we have become in some areas of Britain. The good news is that politicians will now be forced to engage in the micro politics of Britain and come down the ladder from their big picture, "look at me I'm a statesman," role play. It's time to get their hands dirty. Should they ignore West Bradford, and places like it, we will witness a rising tide of extremism in all its evil forms.